Jennifer Lowe was killed by two pit bulls that had been legally declared "dangerous." West Knox County, TN - Jennifer Lowe would have been 22 years old this past Monday. On November 12, 2007, Jennifer was killed by two pit bulls while she visited the home of Charles Smallwood. Because she was on the dog owner's property at the time of the attack, no criminal charges were filed against Smallwood, nor is the family eligible for civil recourse. 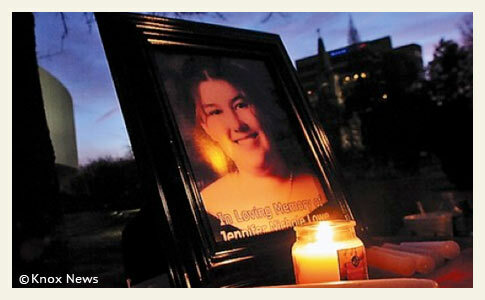 On the day of Jennifer's Birthday, family, friends and relatives gathered on the City Council building steps and held a candlelight vigil in her memory. "First, we are here to remember Jennifer and the life she lived, which ended so tragically," said her uncle, James Pipes. The family also hopes to encourage Knoxville and Knox County to improve their ordinances governing dangerous and vicious dogs. They do not want Jennifer's death to be in vain. Some family members would like more of an investigation into the circumstances that led to Lowe's death by two pit bulls owned by Charles Smallwood, 25, of Sam Lee Road. The dogs that killed Jennifer Lowe had been declared dangerous in August, after attacking another dog, and were supposed to be kept leashed or caged, but there was little authorities could do even after the dogs were witnessed later out of cages and unleashed. Under a new ordinance, approved by County Commission on the first of two readings, law enforcment may seize and impound an animal, pending a citation to the owner to appear in court. Pipes said, "That's a good first step," adding there should also be a requirement that dogs declared dangerous should be muzzled anytime they are around anyone other than their owner. (Smallwood had left Jennifer alone in the house when the dogs attacked).